The SUPERBRAID® Self-Storing Air Hose is made from tough Polyurethane with Polyester Braiding for additional reinforcement. Most other hoses consist of an inner tube, braiding and an outer cover that eventually loses adhesion due to the bending, flexing, expansion and contraction occuring during normal use. This separation of the layers is the most common cause for hose failure. Unlike these other hoses, we manufacture SUPERBRAID® in a way that the inner tube, braiding and outer cover cannot separate.This means that Superbraid® will not break down and its integrity is not compromised over time, assuring a long life of trouble free use! 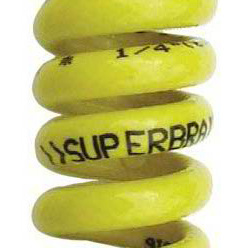 The Superbraid® Hose is very lightweight. Our 3/8" x 50´ hose assembly (the most popular size) is more than 20% lighter than similar hose assemblies from other manufacturers so it's easy to carry around, yet tough enough to resist the abuse of severe applications. 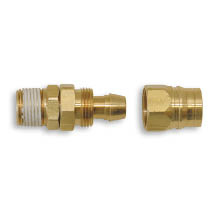 Superbraid® features rugged fittings made from corrosion resistant brass that will withstand the roughest treatment. Our contemporary looking, state-of-the-art strain relief sleeve protects the hose at its weakest point (at the barb) and also enhances the appearance of the entire assembly.While other manufacturers use a strain relief that limits the ability of the hose to bend, ours was uniquely designed to take advantage of Polyurethane's flexibility, giving the user a much wider range of motion without the possibility of kinking. Field attachable compression fittings are available for quick and easy installation without the need of any special tools. For rough applications that may require more frequent repairs, Superbraid® Hose Assemblies can be ordered with reusable compression fittings already installed. We also offer rigid fittings for additional durability on high impact or severe vibration applications.